As a radio-personality Schilling was signed by the Howie Carr radio network to do a Saturday morning politics and sports show. An outspoken conservative, Schilling joined Breitbart in 2016. Schilling began his professional career in the Boston Red Sox farm system as a second-round pick in what would be the final January draft in MLB. He began his professional career with the Elmira Pioneers, then a Red Sox affiliate. After two and a half years in the minor leagues, Schilling and Brady Anderson were traded to the Baltimore Orioles in 1988 for Mike Boddicker. He debuted in the Major League with the Orioles (1988–1990), and then spent one year with the Houston Astros (1991). Schilling was traded to the Philadelphia Phillies, in exchange for Jason Grimsley, on April 2, 1992. After having struggled with the Red Sox and Astros, Schilling was given the chance to pitch and start with the Philadelphia Phillies on a regular basis and flourished as the ace of the Phillies staff, leading the team in wins (14), ERA (2.35), strikeouts (147) and shutouts (4) in his first season with them in 1992. During the Phillies' pennant run in 1993, Schilling went 16–7 with a 4.02 ERA and 186 strikeouts. Schilling led the Phillies to an upset against the two-time defending National League champion Atlanta Braves in the National League Championship Series. Although he received no decisions during his two appearances in the six-game series, Schilling's 1.69 ERA and 19 strikeouts (including the first 5 Braves hitters of Game 1, an NLCS record) were enough to earn him the 1993 NLCS Most Valuable Player Award. The Phillies went on to face the defending world champion Toronto Blue Jays in the World Series. After losing Game 1, he pitched brilliantly in his next start. With the Phillies facing elimination the day after losing a bizarre 15–14 contest at home in Veterans Stadium, Schilling pitched a five-hit shutout that the Phillies won, 2–0. Schilling was named to the NL All-Star team in 1997, 1998, and 1999 and started the 1999 game. In 1997, he finished 14th in NL MVP voting and fourth in NL Cy Young voting. During this season he set the Phillies single season strikeout record with 319, surpassing the previous record of 310 strikeouts set by Steve Carlton whom had held the record since 1972. Schilling either led or tied for the Phillies leader in wins, complete games, shutouts and ERA among starters each season from 1997 to 1999, averaging 16 wins per season over those three years despite the team never finishing the season with a winning record. Unhappy with the team's performance, he requested a trade to a contender in 2000 and was subsequently dealt to the Arizona Diamondbacks. His 101 career victories ranks sixth all-time for Phillies pitchers, 20th in ERA (3.35), 23rd in games appeared in (242), sixth in games started (226), 34th in complete games (61), 13th in shutouts (14), fourth in strikeouts (1554), and eighth in innings pitched (1659.1). Curt Schilling hoisting the Commissioner's Trophy during the Red Sox 2007 World Series Parade. On October 19, 2004, Schilling won Game 6 of the 2004 American League Championship Series against the New York Yankees. Notably, he won this game playing on an injured ankle—the same injuries that contributed to his disastrous outing in Game 1 of the ALCS. These injuries were so acute that by the end of his Game 6 performance, blood visibly soaked part of his white sock, which is now referred to as "the bloody sock". The victory forced a Game 7, which the Red Sox would go on to win to capture the pennant and make their first World Series appearance since 1986. 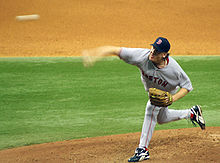 Schilling pitched (and won) Game 2 of the 2004 World Series for the Red Sox against the St. Louis Cardinals. In both series, he had to have the tendon in his right ankle stabilized repeatedly, in what has become known as the Schilling tendon procedure, after the tendon sheath was torn during his Game 1 ALDS appearance against the Anaheim Angels. As in Game 6 of the ALCS, Schilling's sock was soaked with blood from the sutures used in this medical procedure, but he still managed to pitch seven strong innings, giving up one run on four hits and striking out four. This second bloody sock was placed in the Baseball Hall of Fame after Boston's victory over St. Louis in the World Series. A four-game sweep of the World Series erased the Curse of the Bambino. On February 23, 2013, the first bloody sock was sold at a live auction at the Fletcher-Sinclair Mansion for $92,613 to an anonymous bidder. On March 23, 2009, Schilling officially announced his retirement from professional baseball after 20 seasons. Schilling ended his career with a 216–146 record, 3.46 ERA and 3116 strikeouts, 15th-most in MLB history. Having last pitched in 2007, Schilling became eligible for the 2013 Baseball Hall of Fame ballot, but he did not receive sufficient votes for election, receiving 38.8% of the vote. He received his highest number of votes on the 2019 ballot with 60.9%, but it was not sufficient to be elected for the seventh time. On August 2, 2013, Schilling was inducted into the Philadelphia Phillies Wall of Fame. Curt Schilling (left) presenting an "Above and Beyond Award" in 2007. On February 5, 2014, Schilling revealed that he had been diagnosed with and was being treated for throat cancer. On June 25 of that year, Schilling announced that the cancer was in remission. Schilling said his cancer was a result of using smokeless tobacco for 30 years. He also used his experiences to warn Madison Bumgarner, who is also a long-time smokeless tobacco user (a 'dipper'), of the risks of using smokeless tobacco. Schilling had announced that he will challenge Senator Elizabeth Warren in the 2018 US Senate election in Massachusetts , but ended up dropping out and supported Shiva Ayyadurai in the race. Schilling has also expressed interest in running for President in 2024 if Donald Trump is re-elected in 2020. Schilling has also directed comments toward Yankees third baseman Alex Rodriguez, once calling Rodríguez's swat of a tag in Game 6 of the ALCS a "bush-league play" on The Jim Rome Show. During a radio show appearance on May 8, 2007, Schilling criticized Barry Bonds, stating: "He admitted to cheating on his wife, cheating on his taxes and cheating on the game." Soon after, Schilling issued an apology on his blog, stating "it was absolutely irresponsible and wrong to say what I did,"  without, however, indicating his opinion on the statements' veracity. On April 20, 2016, ESPN announced that they had fired Schilling after he shared a Facebook post that many viewed as being anti-transgender, saying, "ESPN is an inclusive company. Curt Schilling has been advised that his conduct was unacceptable and his employment with ESPN has been terminated." Schilling's social media post came shortly after passage of the North Carolina transgender restroom law. In September 2017, Schilling accused ESPN of a double standard when reporter Jemele Hill was not fired or suspended following a controversial social media post about Donald Trump. In an on-air phone interview with CNN, Schilling defended Hill's right to speak her mind, then stated, "I wasn't fired for speaking my mind; I was fired for being a conservative." ^ "Assessing Curt Schilling: great pitcher, consummate competitor, brilliant blowhard". Weblogs.baltimoresun.com. Retrieved June 20, 2012. ^ "Clayton Kershaw first pitcher since 2002 with 300 strikeouts". CBS SPORTS. ^ "Starting Pitcher JAWS Leaders". Baseball Reference. ^ Goodell, Jared. "Curt Schilling Signs On To Host Weekend Radio Show | Howie Carr Show". howiecarrshow.com. Archived from the original on October 8, 2016. Retrieved February 19, 2017. ^ Sherman, Gabriel. "Curt Schilling Joins Breitbart". Daily Intelligencer. Retrieved February 19, 2017. ^ Metcalfe, Jeff (January 20, 2011). "Curt Schilling, Randall McDaniel, Ty Murray, Kerri Strug to enter Arizona Sports Hall of Fame". The Arizona Republic. Retrieved May 9, 2011. ^ a b "Curt Schilling Statistics and History". Baseball-Reference.com. Retrieved June 20, 2012. ^ "1992 Philadelphia Phillies Statistics". Baseball-Reference.com. Retrieved March 5, 2019. ^ "Philadelphia Phillies Top 10 Single-Season Pitching Leaders". Baseball-Reference.com. Retrieved March 5, 2019. ^ "D-Backs holding pair of aces with Schilling deal". ESPN. Associated Press. July 25, 2000. Retrieved March 6, 2009. ^ "Major League Baseball Stats". Philadelphia.phillies.mlb.com. Retrieved June 20, 2012. ^ "2001 World Series Game 7, New York Yankees at Arizona Diamondbacks, November 4, 2001". Baseball-Reference.com. Retrieved November 23, 2017. ^ Francona, Terry; Dan Shaughnessy, Dan (2013). Francona: The Red Sox Years. New York: Houghton Mifflin Harcourt. p. 117. ISBN 978-0-547-92817-3. ^ "SCHILLING'S BLOODY SOCK FROM WS GOES FOR $92,613". Associated Press. Retrieved February 24, 2013. ^ "Schilling: 'I will play in 2008'". Sports.espn.go.com. January 29, 2007. Retrieved June 20, 2012. ^ Massarotti, Tony (February 23, 2007). "Sox to Curt: Fat chance – Team sticks with wait-and-see tactic". Boston Herald. Archived from the original on February 25, 2007. Retrieved February 23, 2007. ^ Horrigan, Jeff (February 23, 2007). "'Business decision' irks Schill". Boston Herald. Archived from the original on February 26, 2007. Retrieved February 23, 2007. ^ "Schilling to file for free agency". ESPN. February 23, 2007. Retrieved February 23, 2007. ^ Steve Buckley (June 15, 2007). "Changeup from Curt: He's open to offer". Boston Herald. Archived from the original on August 17, 2007. ^ "Oh, so close! Schilling loses no-hitter with two outs in ninth inning". MLB.com. June 7, 2007. ^ "Schilling: Master and commander". MLB.com. October 7, 2007. Archived from the original on October 11, 2007. ^ Curt Schilling (November 6, 2007). "Done". 38 Pitches. Archived from the original on November 8, 2007. Retrieved November 6, 2007. ^ "Schilling could miss 2008 season". KFFL. February 7, 2008. Archived from the original on February 10, 2008. Retrieved February 7, 2008. ^ Gordon Edes; Nick Cafardo; Amalie Benjamin (February 7, 2008). "Sources: Schilling out until at least All-Star break". Boston Globe. Retrieved February 7, 2008. ^ Gordon Edes (June 18, 2008). "Back puts Colon on the DL: Masterson will stay in rotation". Boston Globe. Retrieved June 20, 2008. ^ "Schilling to undergo season-ending shoulder surgery". ESPN. June 20, 2008. Retrieved June 20, 2008. ^ Amalie Benjamin (June 24, 2008). "Schilling could be throwing in four months". Boston Globe. Retrieved June 24, 2008. ^ "38 Pitches – Calling it quits". 38pitches.weei.com. Archived from the original on April 28, 2009. Retrieved November 23, 2017. ^ Ian Browne. "Schilling announces his retirement". Mlb.mlb.com. Retrieved June 20, 2012. ^ Ryan Lawrence. "Curt Schilling enshrined, but Darren Daulton star of night". Philly.com. Retrieved January 19, 2014. ^ Curt Schilling and Boston Dirt Dogs (October 27, 2004). "Curt clears the air". Boston.com. ^ "Bledsoe sells New England home to Schilling". usatoday.com. December 23, 2003. ^ Moore, Galen (October 7, 2013). "Curt Schilling estate sale: Furniture, clothes, Hummer golf cart up for grabs at former Sox pitcher's Medfield home". Boston Business Journal. Retrieved October 12, 2013. ^ "Players by birthplace : Alaska Baseball Stats and Info". Baseball-Reference.com. Retrieved June 20, 2012. ^ Schilling named his son after Lou Gehrig and later that year received the Lou Gehrig Memorial Award. Lou Gehrig Memorial Award – Baseball Almanac. Retrieved August 22, 2009. ^ Brian C. Mooney, Globe Staff (October 29, 2004). "Schilling delivers for Bush on 'Good Morning America'". Boston.com. ^ "Curt Schilling diagnosed with cancer". ESPN.com. February 5, 2014. Retrieved February 5, 2014. ^ Curt Schilling [@gehrig38] (June 25, 2014). "As of yesterday I am in remission. Start the 5 year clock!" (Tweet) – via Twitter. ^ "Curt Schilling: 'I am in remission'". ESPN.com. June 25, 2014. Retrieved June 25, 2014. ^ "Schilling: Tobacco gave me cancer". ESPN.com. August 21, 2014. Retrieved August 21, 2014. ^ "Schilling's warning to Bumgarner, other MLB dippers". espn.go.com. Retrieved November 23, 2017. ^ Montopoli, Biran (September 2, 2009). "Curt Schilling for Kennedy's senate seat?". CBS. Retrieved September 4, 2015. ^ Abraham, Peter (August 13, 2010). "Extra Bases – Red Sox blog". The Boston Globe. ^ Schilling, Curt (December 19, 2007). "One players take on the Mitchell Report, Canseco, Clemens, records, looking back or going forward..." 38pitches.com. Archived from the original on January 7, 2008. ^ "Schilling says he backs McCain, criticizes Clinton's anti-Iraq statements". CNN.com. January 29, 2007. ^ "Curt Schilling pitches for John McCain's presidential bid". Associated Press. December 4, 2007. Archived from the original on July 23, 2012. ^ "Massachusetts Voters May Face Kennedy-Less Election". Fox News. August 27, 2009. Archived from the original on August 29, 2009. Retrieved August 27, 2009. ^ Schilling, Curt (September 24, 2009). "Curt Schilling on D&C Discusses Decision Not to Run". 38Pitches.com. Archived from the original on October 1, 2009. Retrieved October 2, 2009. ^ Coakley, Martha (January 15, 2010). "Martha Coakley radio interview: dismisses Schilling as a Yankee fan". youtube.com. Retrieved January 15, 2010. ^ "In 8th Inning, Schilling, Coakley, throw hardballs". Fox News. January 18, 2010. Archived from the original on January 21, 2010. Retrieved January 18, 2010. ^ Koster, Kyle (January 18, 2010). "Curt Schilling blogs about being called a Yankee fan by Martha Coakley". Chicago Sun-Times. Archived from the original on January 21, 2010. Retrieved January 18, 2010. ^ Kimberly Schwandt (January 18, 2010). "In 8th Inning, Coakley, Schilling Throw Hardballs". Fox News. Archived from the original on September 24, 2015. Retrieved August 25, 2015. ^ Neyer, Rob (February 1, 2013). "Curt Schilling comes out... with opinion about gay players". SB Nation. Retrieved September 4, 2015. ^ "Ex-baseball star Schilling: 'I'm going to run' for Senate". TheHill. Retrieved November 23, 2017. ^ Kurtenbach, Dieter (November 16, 2016). "Curt Schilling says he's going to run for president in 2024". FOX Sports. Retrieved November 23, 2017. ^ Gordon, Bob; Burgoyne, Tom (June 1, 2013). "Chapter 99: Wild Thing". More than Beards, Bellies and Biceps: The Story of the 1993 Phillies (And the Phillie Phanatic Too). Skyhorse Publishing, Inc. ISBN 1613214472. ^ "The Providence Journal | Rhode Island breaking news, sports, politics, business, entertainment, weather and traffic – providencejournal.com". Projo.com. February 7, 2012. Retrieved June 20, 2012. ^ "Public Apology". 38 Pitches. May 9, 2007. Archived from the original on May 12, 2007. Retrieved May 10, 2007. ^ "Francona upset about players' comments on Bonds". ESPN. May 9, 2007. Retrieved May 9, 2007. ^ "Schilling blasts Manny". Boston.com – The Boston Globe. September 17, 2008. Retrieved December 14, 2013. ^ "Schilling meets with MLB exec Alderson". East Valley Tribune. May 29, 2003. Archived from the original on September 26, 2007. Retrieved April 25, 2007. ^ "The Ten Most Hated Athletes". GQ Magazine. Archived from the original on November 11, 2006. Retrieved June 18, 2007. ^ Curt Schilling and Boston Dirt Dogs (October 27, 2004). "Curt clears the air". Boston Globe. Retrieved June 18, 2007. ^ "Boston's Schilling excited to pitch without injury woes". Associated Press. February 18, 2006. Archived from the original on October 17, 2007. Retrieved June 18, 2007. ^ Larry Stone (May 1, 2005). "Around the horn: again, Schilling shows his true colors". Seattle Times. Retrieved June 18, 2007. ^ Shaughnessy, Dan (February 23, 2007). "Ace's breaking pitch appears to be outside". Boston Globe. Retrieved April 25, 2007. ^ Shaughnessy, Dan (February 2, 2007). "Curt answers given". Boston Globe. Retrieved May 10, 2007. ^ Shaughnessy, Dan (March 25, 2007). "Famous guest blogs in: Given 'invite,' Schilling issues direct answers". Boston Globe. Retrieved April 25, 2007. ^ "Curt Schilling Contract (no contract until after season 2/22/07)". Sons of Sam Horn. February 23, 2007. Retrieved April 25, 2007. ^ "Q & A VIII, short one". 38Pitches. March 25, 2007. Archived from the original on July 4, 2007. Retrieved April 25, 2007. ^ Gordon Edes (April 26, 2007). "Schilling's sock called into question". Boston Globe. Retrieved May 10, 2007. ^ "Ignorance has its privileges". 38 Pitches. April 27, 2007. Archived from the original on April 29, 2007. Retrieved May 10, 2007. ^ "Corrected MMP History by One of MMP's Owners". ^ "Jace Hall, Ep 6: Curt Schilling, and Wiimbledon!!!". The Jace Hall Show. Season 1. Episode 6. July 9, 2008. ^ "The Instance! World of Warcraft Podcast » The Instance #102 – "The Curt Schilling Episode"". Myextralife.com. July 26, 2005. Archived from the original on December 5, 2008. Retrieved June 20, 2012. ^ "Fires of Heaven Guild Message Board: Green Monster Games (Curt Schilling)". Fohguild.org. Archived from the original on September 27, 2007. Retrieved June 20, 2012. ^ "An Interview with Curt Schilling :: ZAM". Allakhazam.com. November 8, 2007. Archived from the original on February 13, 2009. Retrieved June 20, 2012. ^ "Red Sox Pitcher to make MMORPG". Galbadia X. January 9, 2008. Archived from the original on July 8, 2008. Retrieved January 9, 2008. ^ "Curt Schilling's video-game company gets $75-million loan to come to R.I." Providence Journal. July 27, 2010. Retrieved July 27, 2010. ^ "38 38 Studios lays off entire staff". theverge.com. May 24, 2012. ^ "Curt Schilling's 38 Studios Lays Off All Employees, Deems Move 'Absolutely Necessary'". ^ "38 Studios passes second mortgages onto some former employees". ^ Cohan, Peter. "Bloody Hypocrite: Schilling's 38 Studios Fires 413". Forbes. ^ Niedowski, Erika (November 1, 2012). "RI SUES SCHILLING OVER 38 STUDIOS LOAN GUARANTEE". Associated Press. Retrieved November 1, 2012. ^ "38 Pitches". 38 Pitches. Archived from the original on March 9, 2007. Retrieved June 20, 2012. ^ "Curt Schilling Archive – ESPN Boston". Espn.go.com. Retrieved June 20, 2012. ^ "gehrig38 on Twitter". Twitter.com. March 15, 2012. Retrieved June 20, 2012. ^ a b John Healy (November 21, 2014). "ESPN suspends Keith Law from Twitter after arguing about evolution with Curt Schilling: report". Daily News. Retrieved November 23, 2014. ^ Joe Lucia (November 21, 2014). "ESPN reportedly suspends Keith law for Twitter argument with Curt Schilling (Update)". Awful Announcing. Retrieved November 23, 2014. ^ "Reporter Suspended For Defending Evolution Comes Back, Gives Immediate Middle Finger To ESPN". ^ "The world we live in...Man has it changed. ADDENDUM!". 38 pitches. March 1, 2015. Retrieved March 3, 2015. ^ "Yankees fire employee over vulgar tweets about Curt Schilling's daughter". USA Today. For the Win. March 3, 2015. Retrieved March 3, 2015. ^ "Former Red Sox pitcher Curt Schilling fires back after trolls' violent, sexual tweets about teen daughter". Daily News. March 2, 2015. Retrieved March 3, 2015. ^ "Curt Schilling, Former Pitcher, Philanthropist, Entrepreneur, to Deliver 2010 Commencement Address – WPI". Wpi.edu. February 15, 2010. Retrieved June 20, 2012. ^ "WPI to Award Four Honorary Degrees at 142nd Commencement on May 15 – WPI". Wpi.edu. Retrieved June 20, 2012. ^ "ESPN pulls Curt Schilling from LLWS duty after 'unacceptable' tweet". ESPN.COM. August 25, 2015. Retrieved August 27, 2015. ^ Boren, Cindy (August 26, 2015). "Curt Schilling stood down by ESPN after sharing Twitter meme comparing Muslim extremists to Nazis". The Age. Retrieved August 27, 2015. ^ Curt Schilling [@gehrig38] (August 25, 2015). "I understand and accept my suspension. 100% my fault. Bad choices have bad consequences and this was a bad decision in every way on my part" (Tweet) – via Twitter. ^ Bleier, Evan (September 4, 2015). "ESPN suspends analyst Curt Schilling". Daily Mail. Retrieved October 6, 2015. ^ Pallota, Frank (September 20, 2016). "ESPN fires analyst Curt Schilling over posting anti-transgender meme". CNN Money. Retrieved February 5, 2019. ^ Ingrassia, Nunzio (April 20, 2016). "ESPN fires Curt Schilling after transgender comments". Fox Sports. Retrieved November 27, 2018. ^ Delk, Josh (September 16, 2017). "Curt Schilling says it's frustrating ESPN fired him and not Jemele Hill". The Hill. Retrieved November 27, 2018.